A while back Vivian wrote a blog about the registration problems that were happening in Florida that made groups like the League of Women Voters stop registering students and other groups.This month Florida lost that fight. The League of Women Voters said they are ready to resume their interrupted registration efforts just days after winning a federal injunction against Florida.The League of Women Voters of Florida have started going back to registering citizens and encouraging voters to educate themselves on their government and to vote. This month the League of Women Voters had their national meeting in Washington DC. With around 700 delegates coming to vote on issues representing the various local leagues and state leagues across the country. 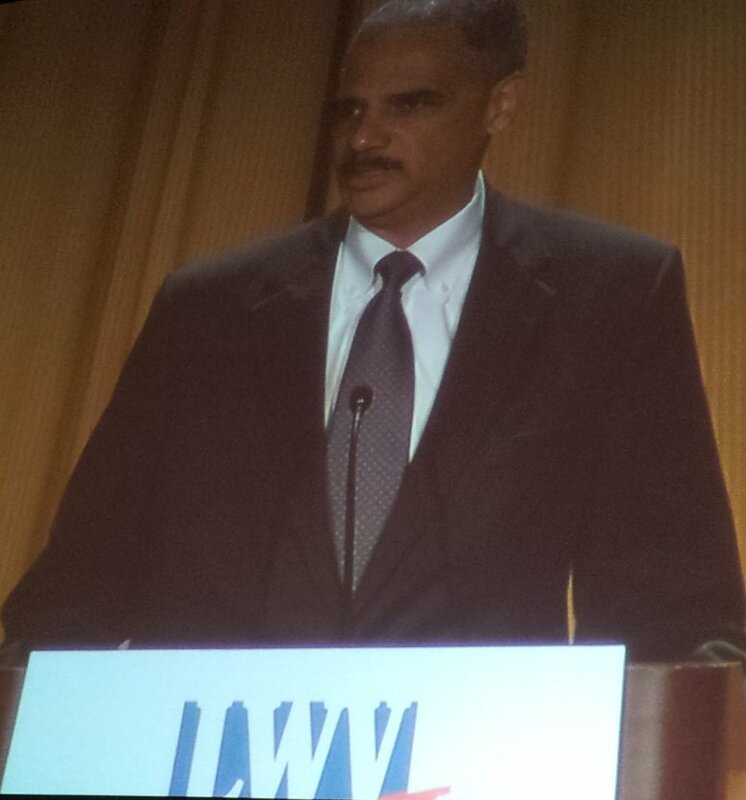 During the convention the US Attorney General Eric Holder stopped by to address the group and specifically the legal battle in Florida over the focus on restricting voters rights. He wanted to thank the League of Women Voters for their fight for over 90 years. Specifically the goal “to ensure that all eligible citizens have access to the ballot box, and to uphold this country’s founding and enduring promise of “government of, by, and for the people.” “. His whole address is here. Now Florida having lost that battle is now trying to purge their voter list within 90 days of an election. This time it is the Department of Justice who is suing Florida. Florida current laws require the 90 days so if someone was to be purged they had enough time to be notified and still come in and prove they are allowed to vote and stay on the list. Normally purging happens in states because people may move, die and also many convicted felons are no longer allowed to vote in some states. However, Florida is focusing on 182,000 voters who it said might not be citizens. Now I have never lived in Florida and maybe their registrations requirements are almost non-existent. However, I have lived/voted in Virginia, North Carolina and Georgia and I always had to show the proper id’s to be able to register to vote. So I don’t know how Florida is getting all these supposed non-citizen voters. A lawyer for the Florida State Association of Supervisors of Elections found that most people on the list who had been contacted so far were legal voters. An article from the New York Times did say they had identified 85 voters who were registered illegally. They did not say they were non-residents but still how did the 85 slip though. Florida might want to consider looking at that instead of tossing out the other 181,915 who are on their list who are legal voters. Regardless of that fact Florida has a law that they are bound by. If they want to change the voter laws they have to pass the new law and submit it to the Department of Justice for approval. Of course that would take more than 90 days and they are specifically trying to ignore this law for the upcoming election. I have to admit when I first read this I thought of some laws passed by the Virginia General Assembly that I would like to “just ignore”. However, we have elected officials to vote on laws for a reason. We can’t just ignore the laws we just don’t like. I am pretty sure if a Virginia Highway Patrolman were to arrest me for breaking a law the excuse that “I thought it was just a suggestion” would not work. Next Post Is UVA mess brought to you by Goldman Sachs and EDMC? I suspect that the non-citizens on the roll were registered by organizations such as the League of Women voters. Do you think that such organization should bear any responsibility should they register ineligible applicants? What is your ‘suspicion’ based on? Do you have any facts to share with us? Have you heard somewhere that the LWV is terrible at registering voters? Please, do tell. NARCELEB in all states there are laws which groups are required to follow in order to be able to register. Any group that breaks those laws are responsible. The laws are up to the state which was my point. Also the state said 85 were found but you might be illegally registered if you moved from one apartment to another and did not notify the registrar. Is that the kind of thing they were referring to or someone who is not a citizen of this country . They did not say. There is a big difference. I seem to sense a trend lately where people think rules should apply to everyone else but not them as they have some sort of exemption. This is the other reason for my post you can’t just ignore laws because your special or its just not convenient for you. As far as the League of Women Voters they are a non-partisan organization. Which means they do not endorse candidates. Their concern is that all legally eligible voters are allowed to vote and that people get educated about the issues and candidates opinions so they can make the right choice for themselves on election day. The League of Women Voters has been registering people for over 90 years. They follow the rules and are one of the most trusted organizations to do this because they are non-partisan and are not trying to get anyone to vote for any specific candidate. I think their record over the 90 years stands for itself and needs no assistance from me. NARCELEB is a tea bagger. They don’t need facts or truth. Just throw something out there, the more rediculous it is the better. They know some folks will beleive anything. If non-citizens are registered to vote, there can be only two possibilities. Either the State registered them (“motor voter”) or a non-state group such as the LoWV did. The State seems interested in cleaning up the rolls, and the non-state groups are fighting it. Now, I think that if an ineligible person is registered to vote, the group that registered that person should face some penalty. Is that unreasonable? I really do not see why the States should even allow voter registrations by non-state groups. Non-partisan? Really? Go read their policy positions. With the exception of their Agriculture policy (half-and-half) and their Trade policy (reduce trade barriers), they are on the left on pretty much every other issue. In my original response I agreed if a group was breaking the law to register ineligible persons to vote they should face the penalty for breaking the law . So I do not know why you think I am disagreeing with you on that. As far as your statements about the LWV. Yes non-partisan. Yes Really . Most people don’t really know what non-partisan means. Non-partisan means an organization, event or person in which there is no formally declared association with a political party affiliation. It does not mean a group does not agree with your 100% of the time they are the “other side” . The League of Women Voters has debates where both candidates can express their views. They have forums on issues where they allow both sides to present and answer questions. I once was at a public forum on an issue and one of the presenters said to me this is not non-partisan. “If it were the other side would not have been allowed to speak only us. “ He did not understand what non-partisan meant. The League of Women Voters puts on the forums so people can make up their own mind about an issue or an election. As for the studies you linked to . Just for your information. Studies take over two years to determine what their policy will be. They have people read both sides of an issue and write papers noting things that should be considered with references back to the main papers. Then the local leagues across the country study these individually and come up with opinions on the issue. Then the policy is voted on at a National Convention. Sometimes the vote may be almost unanimous sometime it barley passes/fails. Either way everyone gets their input and vote. Which ever way the vote goes that is what determines the policy. Instead of a small group of people telling the whole body what they should think it is decided by all voting delegates. I do not see this as a bad thing. I am asking you for your opinion on what the law should be. The onus of proving eligibility would then be on the person registering voters, which is not possible. Registrants are checked in the Registrar’s office for eligibility. If the decision took place with the person registering voters it would be a bottleneck…procedures would need changing. Those resources are not generally available to that person. The end result would be fewer registrations, less voting, and less democracy. And you need to acquaint yourself with the history of the LWV. To do so would prevent you from looking like an uneducated fool. If these organizations cannot take responsibility for the eligibility of those they register, then why do you bristle at the idea that they are probably how the ineligible voters got registered? As for the LWV, history is irrelevant. Their positions are about 80-90% left-of-center, that the remaining 10-20% are bipartisan positions anyway. Do you really look at the history of Planned Parenthood — its initial purpose being to reduce the reproduction of Blacks — when you support what they do now? Do you look at the racist history of the Democrats, or do you support them for what they are doing now? Narceleb, sorry did not understand what you were asking. I think the law is the best it could be in the current technology state of today. Currently in Virginia, (I don’t know anything about registering in Florida) , a person signs a form and says they qualify by meeting the requirements such as being a citizen and not being a felon. The person taking their signature has no way of knowing if they are indeed a felon. That is why it goes to the state and the state verifies they are qualified. How would groups know. I imagine in the future everything will be in easily accessible databases or we will have some form of id that links everything together like in some sci fi movie. Virginia seems to be doing a good job with cross checking databases upon registration. They also do a good job of cleaning off the deceased voters. Why would anyone listen to NARCELEB’s dribble more than once. even other baggers won’t listen to that BS.